My name is Angelo. I've been playing DotA for a bit over a decade now. I have recently come into some extra time, and I would love to give back to the community by teaching new (or even experienced) players anything I can about the game. One catch before you read further: I will only teach support heroes. I can play carry heroes in public games, but in high tier games, my carry/mid really fall short. I'm not going to teach anyone the incorrect way to play a hero, and I'm not comfortable playing against GOOD players with my carry/mid heroes. As far as experience, I have played some great players and I think my support has really solidified victory in many games. Some players include Blitz, Fear, Purge, Sing, Cici, Demon, Loda ,Sneyking, randoms from ROOT| etc etc... By no means do I win often against such talented players, but if we do lose, we rarely get rolled. As far as communication or methods of teaching, I'm not really sure what is best. I've never really "mentored" anyone before. I've taught friends to play, but they take DotA very casually, and I'm sure anyone who applies will want to increase their skill as much as possible in the shortest period of time. I was thinking we could sync up a replay of yours and go through it and point out your mistakes, or one of my replays and I point out my mistakes. I could also spectate you and give you advice, or we could just play together. My least favorite of these is "playing together", simply because I'm usually very focused on the game, and it's very hard for me to play well while explaining what I am doing and why (In the depth required that I would consider "helpful" to you). Whatever you'd like, feel free to add me on Steam. I normally use Skype with friends, but I can also use Mumble or Ventrilo. I prefer Skype though. Finally, here is my Steam account. Just add me, and if I'm ever on DotA, just send me a message. Hello, I'm raca and I've been reading the forum tutorias for a while now, but hadn't really registered before. I have about 100 hours of experience in dota 2 over about 6 months (was not a dota 1 player). I enjoy playing a few carries once in a while, especially since I feel I do it better than a lot of pub players, and sometimes playing support for these bad farmers can be frustrating. That being said, I am more comfortable and happier playing as a support. I feel I do way more for the team. I approached angelo yesterday for some tutoring and it was great. He immediately added me, and after a while we talked on skype. What a great guy, just super nice, and willing to answer all my questions. We watched a replay of mine, then a replay of his, all the while talking about what I was doing, what I could be doing, what I SHOULD be doing, lol. It was surprisingly helpful to just have someone (and yourself) REALLY analyze your every move. Especially someone like angelo who really knows what he's talking about! Anyway, I really reccomend giving him a shout if you are serious about starting to up your game in dota. Just an all-around nice guy and very knowledgeable. He found time for me today and we had a really good time while playing dota for hours. We started with reviewing 2 replays of him, one with shadow demon and one with lion. While watching the game he explained nearly everything what was happening extremely well. After that we played a few botgames where we switched between support and carry. All in all I can say that I learned a lot about support and how to play it correctly. He really knows what he is doing with Shadow Demon, so, if you are intrested in that hero ask him! I started to play dota2 since a week, with no previous moba experience (although i played a lot of sc2) and i tried asking for guidance to Angelo. Even if im a complete beginner, he helped me greatly to understand the base mechanics as support, and showcased the shadow demon gameplay. You can immediately tell that he knows what he is talking about. He also is also very patient and forgiving! This guy is amazing, he taught me most to get off the ground and test some support heroes to begin with to learn the inner workings. He taught me Shadow Demon to begin with and showed me ways to improve my timing. He also showed some of his replays to mentor me on how he may play that way I get a better understanding of the heroes. I watched a few replays with angelo and we played a game together. He gave me some great advice on positioning and how to combo my skills with shadow demon. Fun guy to talk to, respectful and gives all around great advice. Unfortunately, there is some bad news that I'm going to have to share, and it is the primary reason I am bumping my own thread: I need to lay down some rules for my mentoring. I'm actually getting ready to play with one of the guys who posted above this (Morpai :D) so I'm going make it brief! 1. Have a working mic. I helped a guy today with no mic and it worked OKAY, but I want everything to work perfectly, or as close as possible. 2. Speak SOME English. If it's your 2nd language, that's fine. No problem. I play with all sorts of players outside of the US and they have pretty broken English. As long as there is some basic words I can make out, we're golden. Add me, let's play! 3. Make time for this. I'm taking time out of my day to help you get better at a video game. I have 2 jobs, so I don't have a ton of time. While we're on Skype, please don't have vacuums in the back, or be talking on your phone. It's disrespectful and I will not continue to help your. 4. Don't be cocky. If you're coming to me for help, you're acknowledging that I may have knowledge to teach you. Please don't constantly cut me off, or try to rush training. I was helping a student by making a lobby for just us and showing him all of the ward/counter spots and explaining them. When I asked him to join the game, he replied "Can't you just message them to me here?" The answer is "No". This game has the most STUPID learning curve in the history of video games. I'm teaching you through experience, and side by side with you. 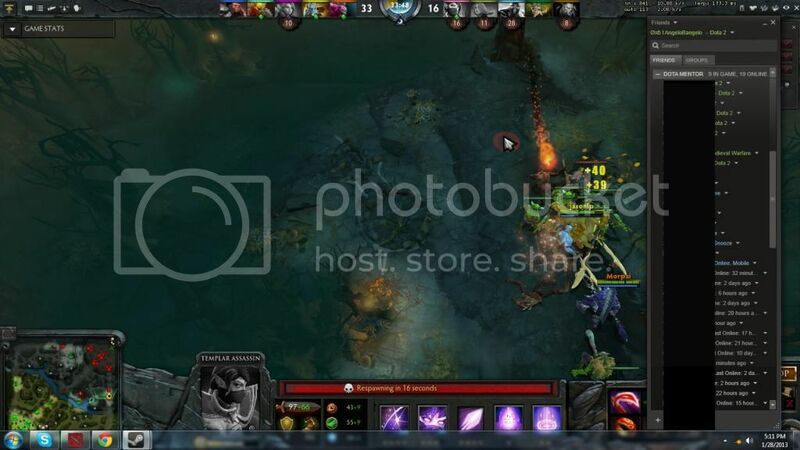 You can't shortcut DotA. It always wins. 5. Last one, because I want to help Morpai, whom is SOOOO patiently waiting for me on Skype (Thanks again! :D:D:D). Come to me. I've added over 35 (as in 10+10+10+5) people to my friends list since this thread has gone up. I have more students in DotA than I have REAL friends in DotA, CSGO, and L4D2 ALL COMBINED. So YOU need to come to ME, when I'm available. Also, don't get upset if I can't play at the moment. I'm trying to give everyone equal time. Again, this has been great for me, but I only ask for some basic levels of respect, considering what I'm doing. Hopefully I'm not coming off as arrogant or rude. I'm just asking for you to respect my time, and the time of everyone else I'm helping. Thank you again for all of the positive feedback. I look forward to helping you guys out in any way I can.